Our newest labmate addition will be of interest to those of you working on the brand and culture of your company. From 2010 to 2013 Markus Kramer was Aston Martin’s Global Marketing Director and before that he was Harley-Davidson’s Marketing Director EMEA. Now you can find him at markuskramer.net where he builds, scales and delivers brands. Luxury brands celebrate a culture of passion for their brand, their products and their people – often stemming back hundreds of years. Based on concepts as old as humanity itself, luxury represents the discipline of branding in its finest essence and stands true at the pinnacle of differentiation. It is the antidote of commoditization. The intangibles within luxury are powerful drivers of growth, generating consistently high profit margins and customer loyalty beyond ‘points and rewards schemes’. Even in times of slower than anticipated growth in Europe, a dropping GDP in China and Russia struggling for peace… growth rates in the luxury sector are still higher than in most other industries. A world hidden to most, associated with high price tags and a guaranteed aura of mystique, luxury operates differently. What can we learn from this culture? You name it, real luxury is (deliberately) not easily accessible. In order to create this position of power, Luxury draws on stories steeped in history, genuine and ethical craftsmanship and the unquestioned integrity of material and provenance. In terms of distribution, many luxury brands will not only control sourcing, but also have vertically integrated retail channels – making sure nothing is left to chance. Apart from high (and often beyond all rationality) price positions, there is one more critical yet often-undervalued factor that distinctively differentiates luxury from the mass and premium business models. Passing on the skills of mechanical engineering over generations in fine watchmaking, for example, is no easy feat. In times of contemporary living, not many youngsters will opt for a career filled with hours spent over magnifying glasses moving minute pieces of precision parts into place with tweezers. Yet it is exactly in these deeply rooted doings that we find some of the most interesting and differentiating insight: Luxury celebrates product over the customer. Hard to believe, but true. Luxury companies are made up of perfectionists, where only the best is tolerated. This goes for the quality of output, as well as for the dedication and capability of the people they employ. Of course the customer represents the very reason these companies exist and do well – but deep down, there is a mutual understanding by both the company and the customer centred on a shared passion and appreciation for the finest product, the best craftsmanship and an ensuing, mutual respect for one another. Often the customers are experts and so closely involved within these companies that joint collaboration on a master timepiece or on an individually configured car would put many new world marketers out of their debt. Whilst the modern discipline of marketing is re-discovering the idea of ‘putting the customer at the centre’, the luxury industry has practiced it all along: customer inclusion. However, luxury is not a democratic process and hence this applies generally only to the making of a product that has already been designed – innovation within Luxury is a separate topic all in its own right. If you hire for money, you’ll get people doing a job. For luxury brands, employing the right people is absolutely vital. Finding and retaining not only people with skill but with a true sense of believing makes all the difference. I have not come across any luxury company with a corporate culture that would not reflect this. This is generally not something that is trivial to cope with. Luxury goods companies are often headed up by incredibly opinionated leaders in organisations that are well structured – and underpinned by a common purpose so strong that it will eject ‘non-believers’ rather swiftly. If a non-believer ‘enters’ it is often by mistake. For the ones who do find a home however, it habitually results in a lifelong, fulfilling career. It is not uncommon to find third – or fourth – generation watchmakers within the same watchmaking company in the Swiss Jura Mountains, for instance. Over time, this strong idea of a common purpose, expressed in shared passion transcends staff and customers alike and becomes a self-propelling mechanism that drives innovation, great product, fulfilled employees and loyal customers. The lines in front of an Apple store when Apple launches a new product are no coincidence, but a clever way of using some of the codes inherent in the luxury business model for a technology product. The same goes for distribution (vertical control of value chain, think Apple Store) and culture, too. 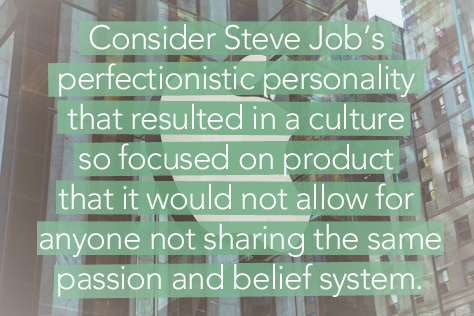 Consider Steve Job’s perfectionistic personality that resulted in a culture so focused on product that it would not allow for anyone not sharing the same passion and belief system. Polarizing? Sure. Successful? Very. Differentiation and offering value propositions with real integrity (not just in the product, but in the culture too) are no longer an option, but a key to survival and success. Building strong cultures that truly capture, enthuse and drive staff and customers alike also means building a value system (i.e. Brand) with purpose, focus and consistency. Luxury brands offer not only strong cases in branding lessons, they also offer deep insights into the mechanics of how to activate on passion and build a network of like minded people around it for the benefit of greater and better products, healthier margins and both happier staff and customers. Great read! Company culture can make or break you. I believe that this starts at the top and is something that has to be lived and breathed every minute of every day. This top down approach is the only way for this to be achieved successfully. I think some of these principles (passion and brand loyalty) apply to cars as well as luxury brands. I just finished reading “A Man Called Ove” and this article brought to mind Ove and his friend Rune who were stalwart loyalists to Saab and Volvo cars respectively. It’s interesting what passion and loyalty can inspire.